The BSM HS model is based on the British HORNBY-SKEWES unit produced between 1967 and 1969, as used by Ritchie Blackmore, the brilliant and impulsive guitarist of Deep Purple. The unit produces a powerful and biting sound that was used to help create the epochal masterpieces e.g. "Deep Purple In Rock" and "Fireball". 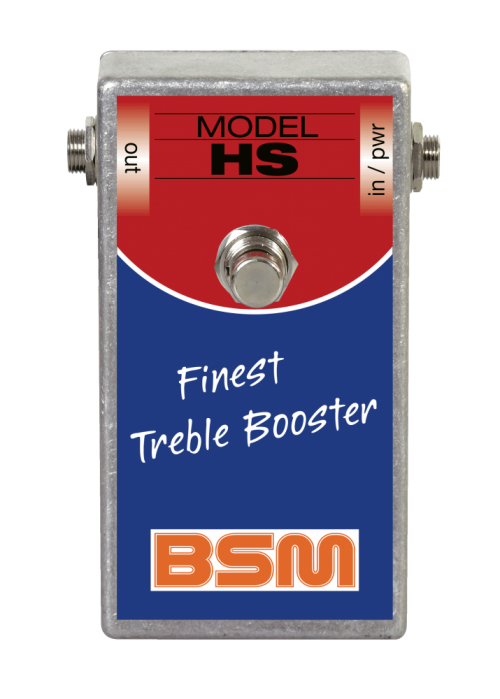 The long yearned for new edition, now issued under the name HS from BSM, includes the same germanium transistors as the the original 1967 version. The HS-Custom model includes a volume control (like Blackmore's modification). When dialed about halfway, you will achieve Blackmore's sound on the Deep Purple album e.g. "Machine Head", "Burn" and early Rainbow records. If you have any questions concerning our products, especially the BSM HS Treble Booster, our tech-head and mastermind Mr. Bernd C. Meiser would be happy to talk to you. So don't hestitate any longer and send him an email to info@treblebooster.net or use the contact form to contact him.